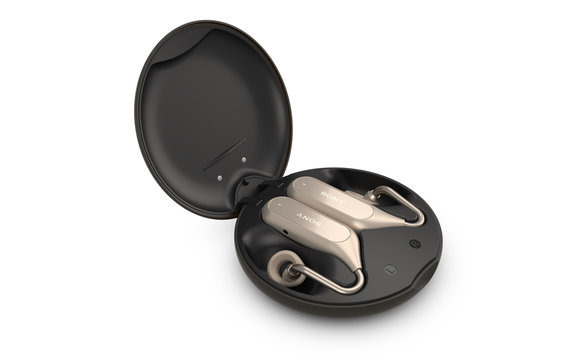 An upgrade of the Xperia Ear, the Duo uses new "Spacial Acoustic Conductor" technology to let people hear music and ambient sound simultaneously. Since this is deeply interwoven with the product's design, however, wearers can't shut out environmental audio. Tap gestures are used to trigger voice assistants or control music feedback, and people can even nod or shake their head to respond to incoming phone calls. Battery-wise the earbuds should last four hours on their own, but as with Apple's AirPods —and some other wireless earbuds —they come with a charging case for refueling. The case provides up to three more charges. Sony is currently planning to launch the the Xperia Ear Duo in May at a cost of $279.99. Preorders should begin shortly on Amazon.